Trick or treat time is just around the corner! Planning a Halloween party for little ghosts and goblins? The Land O’Lakes Test Kitchen experts have created appetizers, sandwiches and Halloween desserts to add scary, spooky and yummy fun to the party. 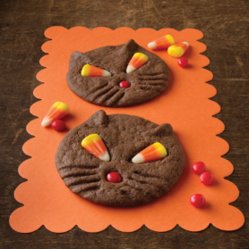 These chocolate cookies make a cute, fun Halloween treat. The candy corn eyes take on a unique look when baked. The key to great Halloween recipes is to strike a balance between scrumptious and spooky! Candy corn can be a fun ingredient in Halloween dessert recipes, including Candy Corn Chocolate Cake, Scarecrow Treats and Black Cat Cookies. “Halloween is all about sweet treats and candy, and if there’s one candy that everyone associates with Halloween, it’s candy corn,” Wahlund says. The Test Kitchen uses candy corn as a primary ingredient in some Halloween treats and as a simple decoration in others. Store-bought decorator icing and gel in tubes are convenient ways to decorate. “Or use a pastry bag filled with white icing and fitted with a plain tip to create an amazing spider web pattern on top of a cake,” says Wahlund. The Land O’Lakes Test Kitchens are always developing fun new recipes for holiday entertaining and everyday meals. Visit the landolakes.com website and sign up for The Measuring Cup® Newsletter, a monthly email containing recipes, cooking tips and free coupons from Land O’Lakes.